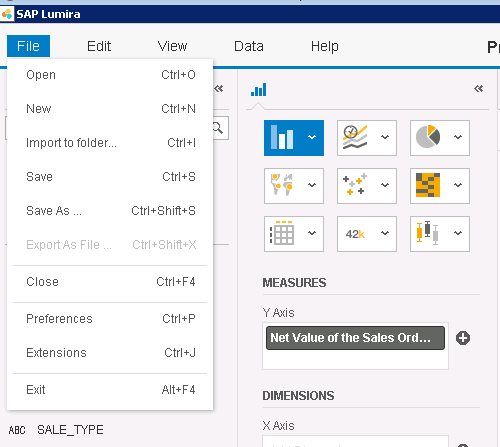 Welcome back to Part 2 of the Lumira tutorial. If you directly landed on this tutorial, please read Part-1 first before continuing. We now get a fresh report page. We would need to define a source for this new dataset. 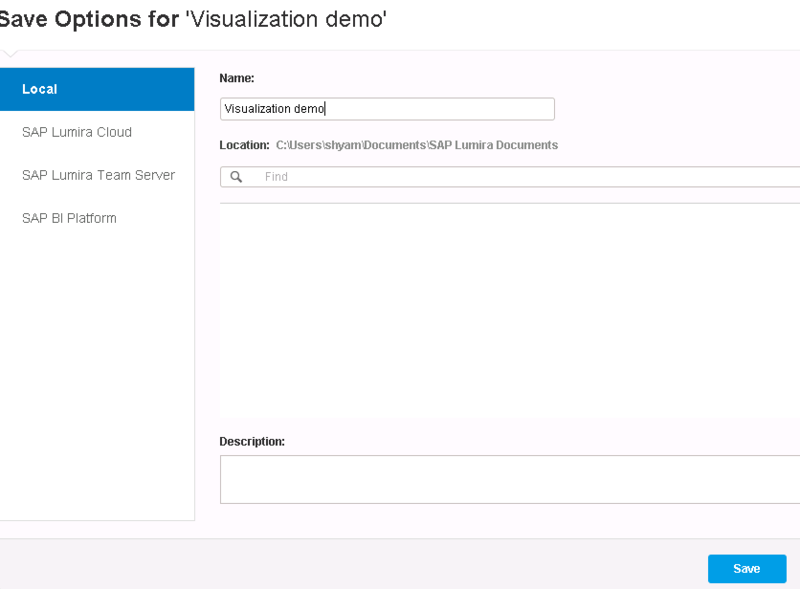 Under the visualize tab, click on Add dataset as marked by the arrow. The connection details are asked again. Press Next. This time, we pick up the sales view. This view had a user input variable defined inside of it and hence, at the least the mandatory variable, V_VKORG would require a value to move forward. As an example, I provide the value 1000 here. 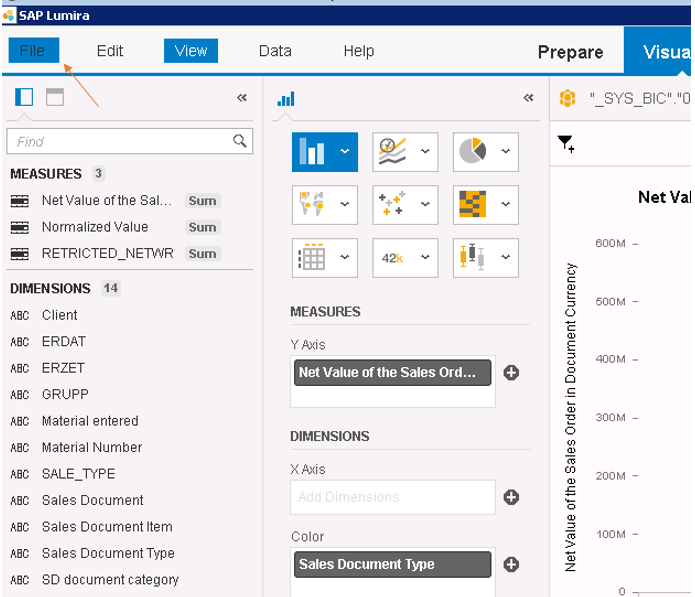 Select all the fields you require to create the Lumira report in this step. In this example, I select everything. Press Create. Pull Net value into X axis. Let’s analyze this by different Sales Document Types and break them up into different colors. After pulling in the required fields, the settings look as below.. The chart looks as below. 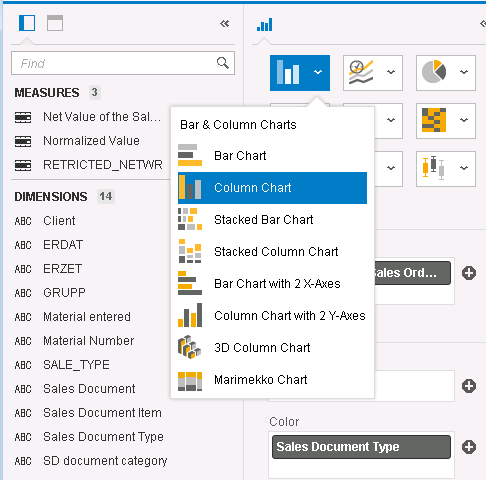 It seems that there are only 2 Sales document types available and the net value is really high for one of them (the gray bar). There are more chart types you can switch to, depending on your requirement. For example, let’s switch the chart type to Column. The chart switches as below. To save this report, go to “File” from the context menu. Now select Save or Save As. This opens the different places where you can save this document – Locally, on the cloud or BO repository folders. It’s all based on your requirement. Give the report a name and press save. 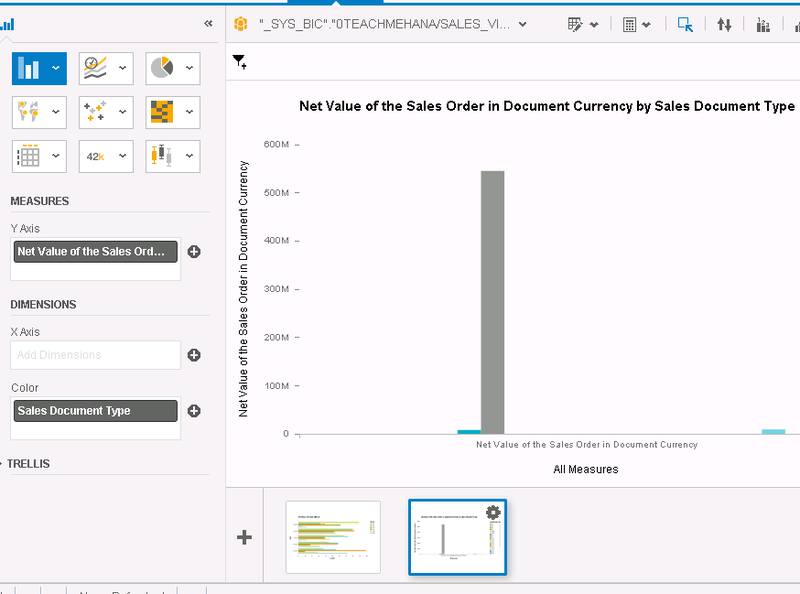 I hope you can now easily understand how Lumira interfaces with HANA views to produce visualizations. It gives more power to the business user and can add a lot of value by reducing dependencies on IT. Please share a tutorial on social media to help us grow.